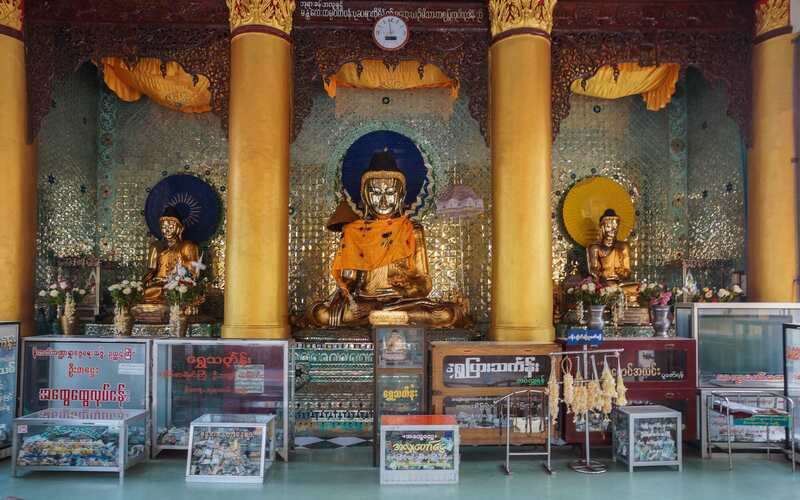 ← Pindaya’s Shwe Oo Min – The Shan Cave of The Ten Thousand Buddhas! 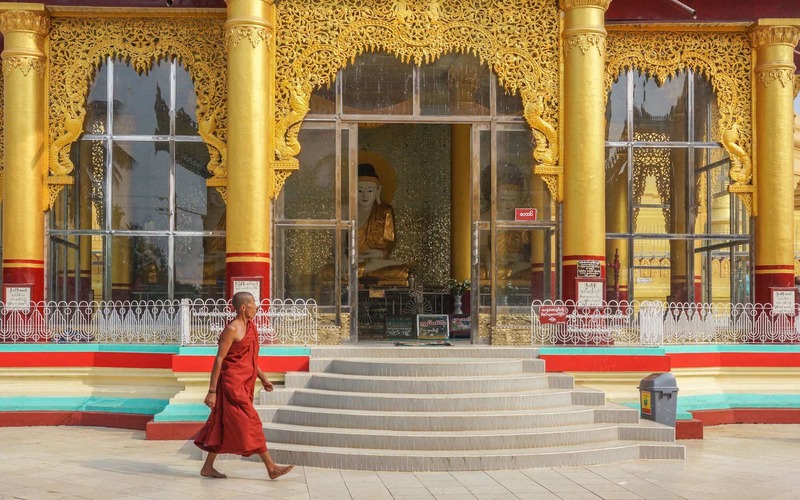 If you find yourself in Yangon and have spent all the time you want to in the city, a day trip to the once-capital of a Mon kingdom in the lower Myanmar area is a worthwhile possibility. 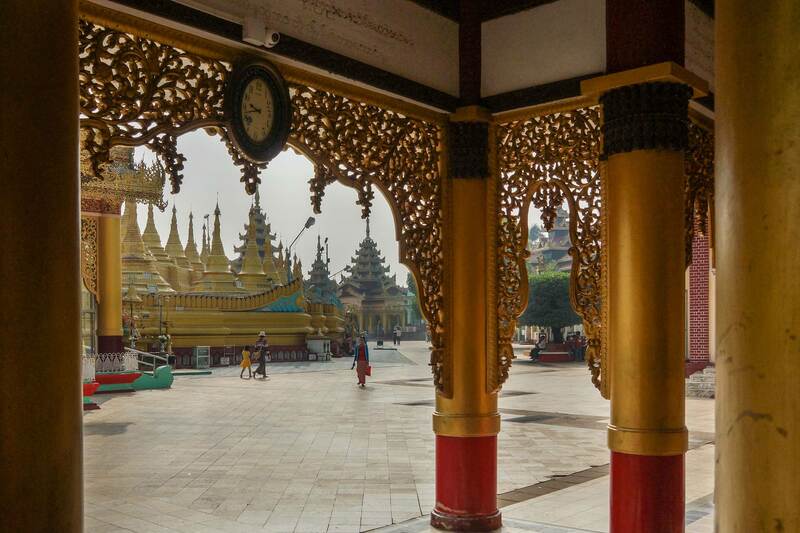 Some seventy kilometers north of Yangon is the modern city of Bago, formerly known in English as Pegu. From 1365 to 1625 C.E., it flourished under a string of competent rulers who left impressive religious monuments. These works not only expressed but helped strengthen their claims of spiritual legitimacy and worldly power. The person at my hotel’s reception desk arranged for a taxi to pick me up at 7:00 a.m. For $70. U.S. I would have the service of an air-conditioned car for the day. The driver Yan had done the trip often before so he already had a checklist of sites to visit in his head and we wasted little time getting from place to place. With another passenger or two to split the cost, the trip would have been downright cheap! It was still worth it. 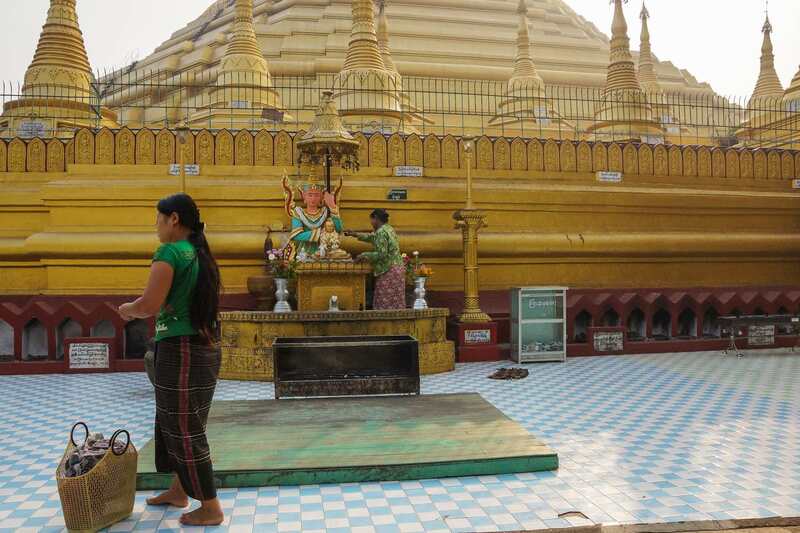 Bago’s most famous site is the great zedi or stupa pictured above. 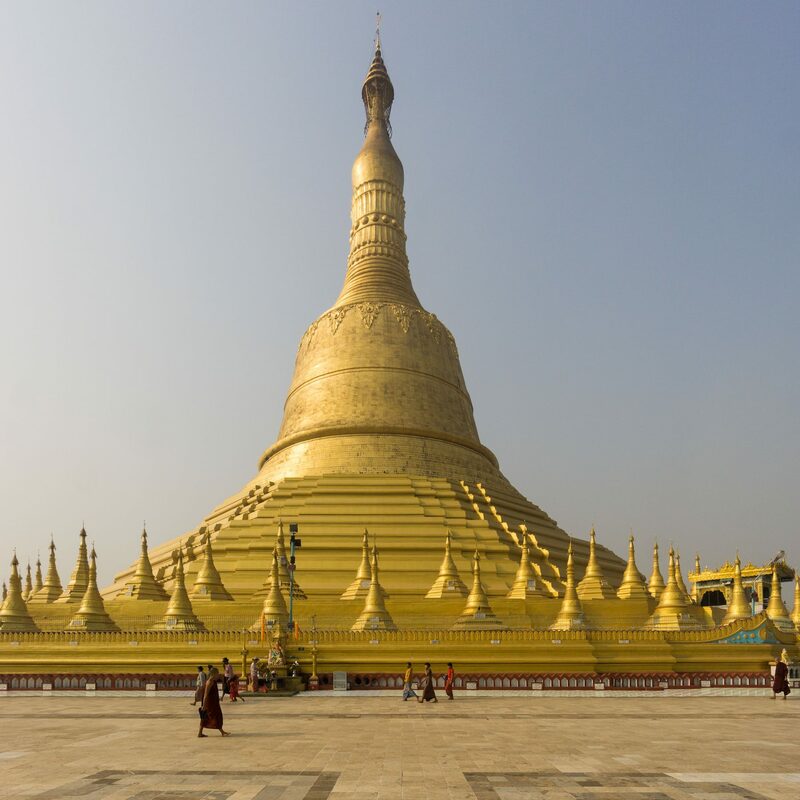 (For some reason the word pagoda – not a Burmese term – is often inaccurately used to describe it.) 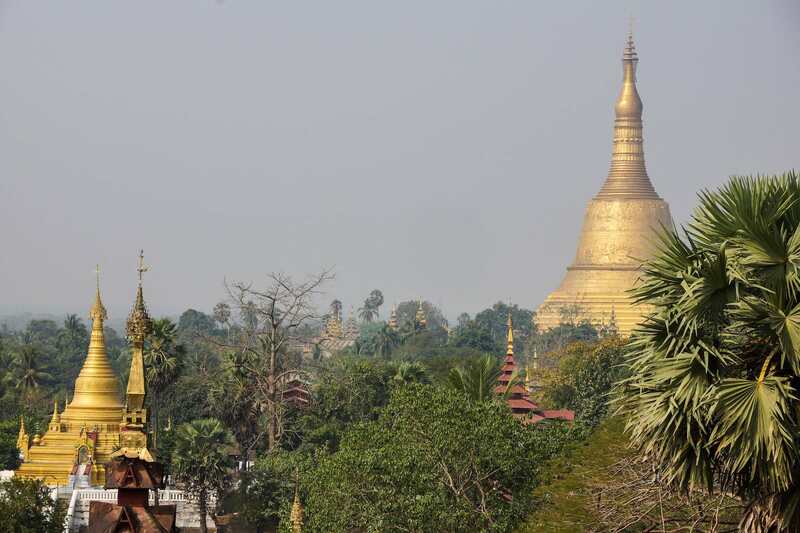 At 115 meters (376 feet) it is currently the tallest in the country, reaching 14 meters (46 feet) higher than Yangon’s Shwedagon. 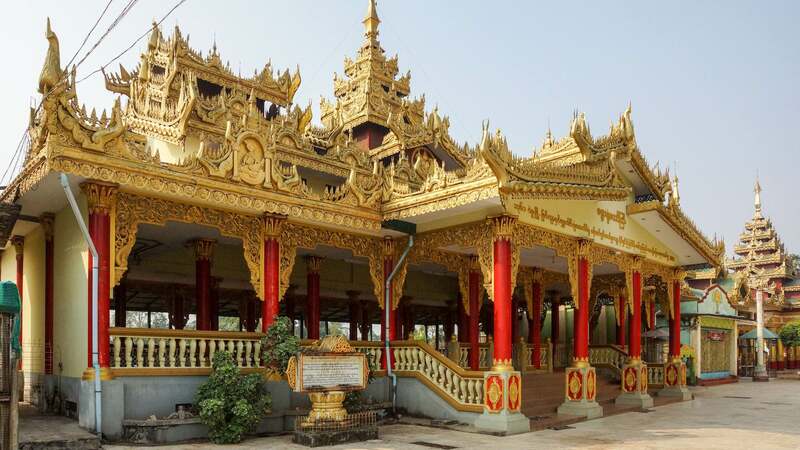 The zedi which stands today was erected in the 1950’s and is the latest in a series of constructions, the first of which was built perhaps twelve hundred years ago. 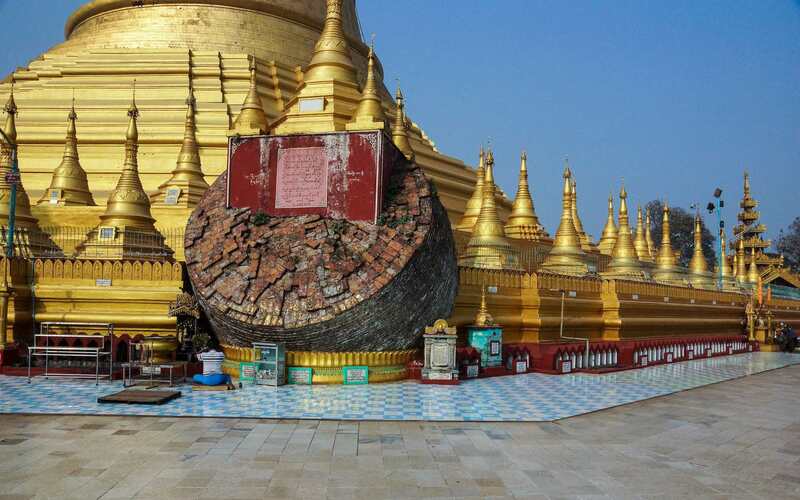 Massive earthquakes over the centuries – including one in 1917 and another in 1930 – means that the structure has been rebuilt often, each time a little taller. 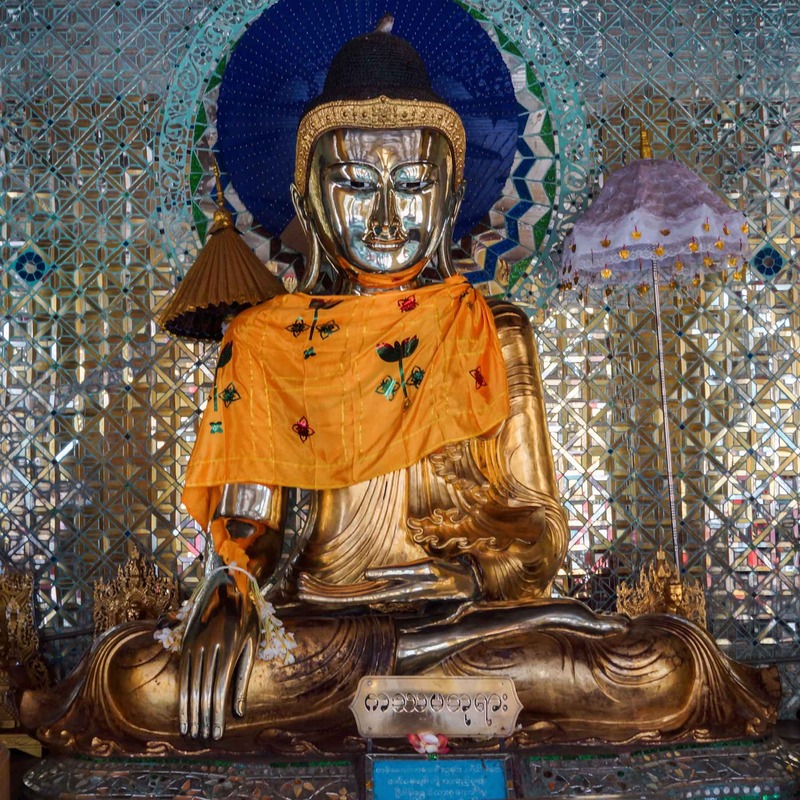 Associated with the zedi are the usual relics of the Buddha – the strands of hair and a tooth or two – that infuse the structure with their perceived power. 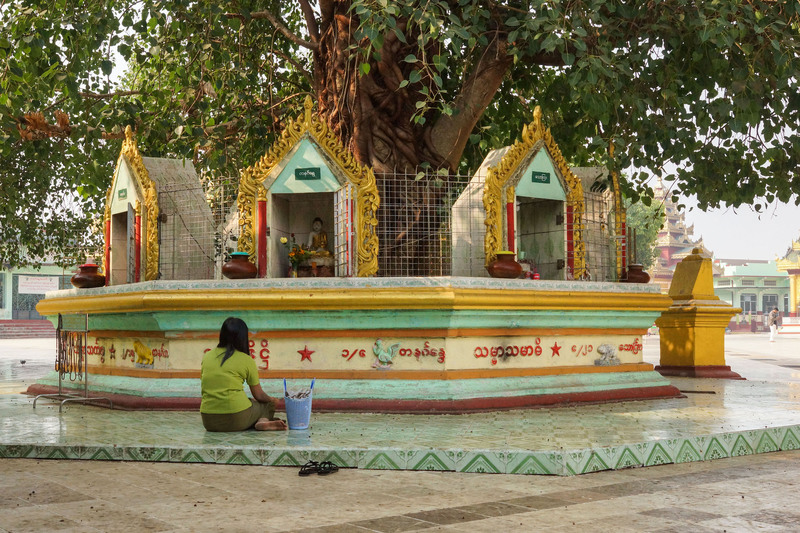 Another important draw of the zedi is the presence of the eight planetary pillars or posts arranged around the octagonal base to which believers are drawn, depending on their day of birth or the advice of an astrologer or astrological chart. (Wednesday is divided into two days to make eight different possible days of birth). 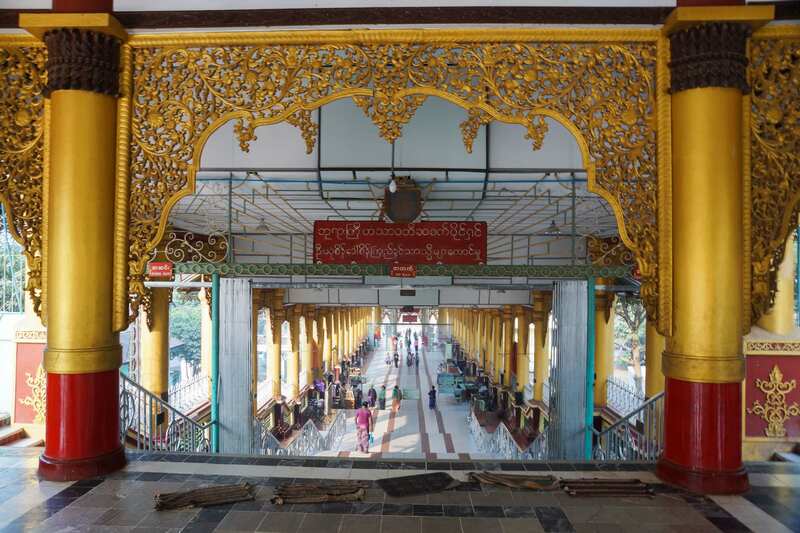 As at Yangon’s great zedi, you enter the Shwemawtaw by one of the four long covered passageways – one at each of the cardinal directions. (See map above.) There is a almost-bazaar-like feeling in the air as you walk up towards the steps to the grand terrace on which the zedi sits. Once on the terrace around the zedi, there are a number of pavilions and shrines; the one above happened to be the first one I passed by after entering from the West entrance. 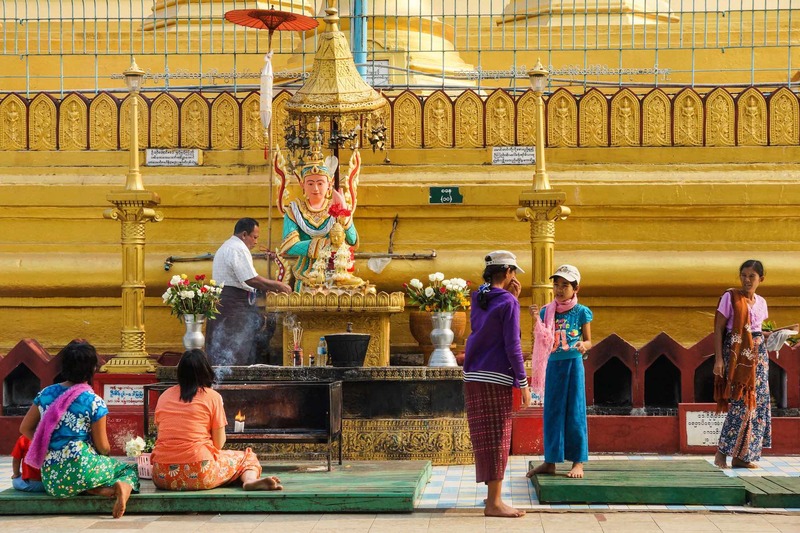 The Shwemawdaw terrace is more open and less cluttered than the one around Yangon’s Shwedagon. I was there at 9 a.m. so it was not yet very busy. 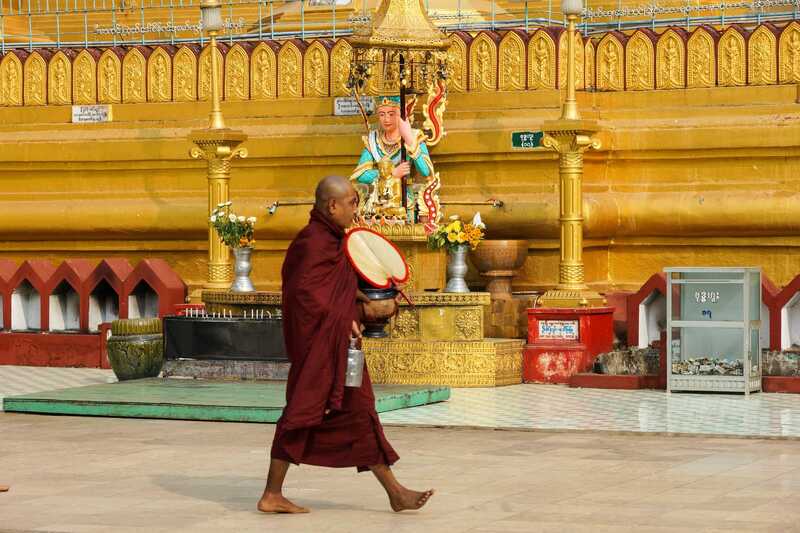 (The time approaching dusk is a more atmospheric time to visit, thanks to the presence of many more worshippers.) 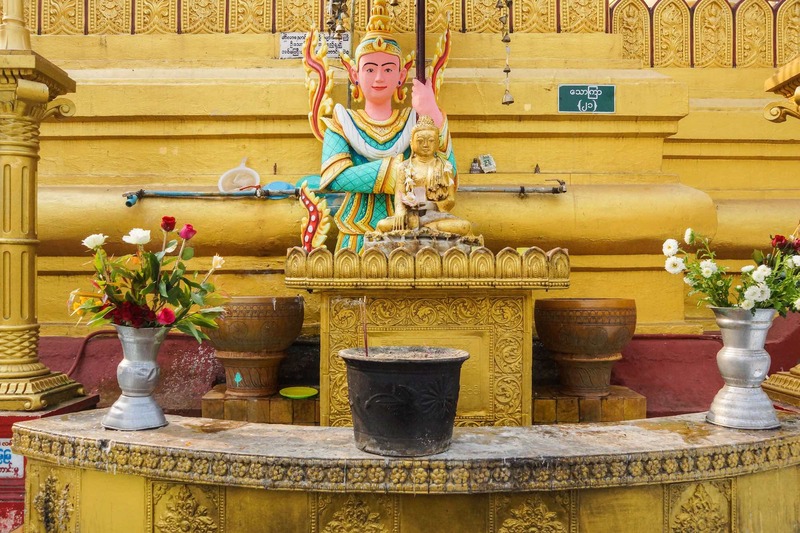 However, each of the planetary posts already had people bringing flowers and providing the Buddha figures with ritual baths. 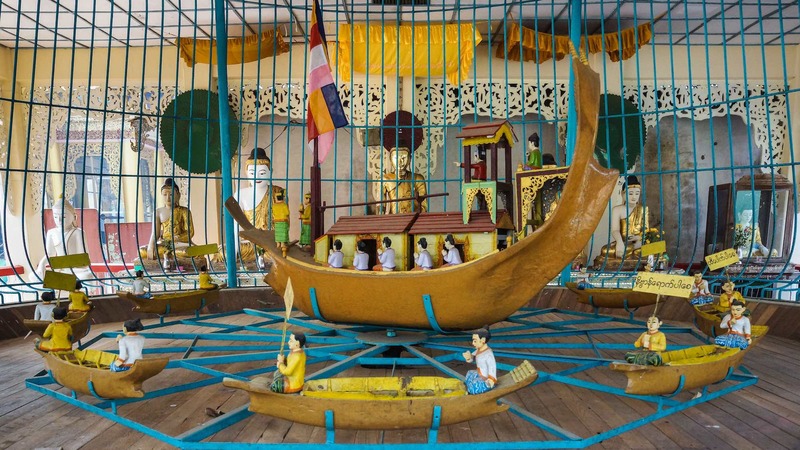 During its heyday, Bago was a port city and ships would come up the Bago River from the sea. However, by three hundred years ago the river had changed course and the city found itself cut off from the river. Of course, the invasion and destruction of the city a couple of times in the past four centuries in the brutal course of war did not help matters. 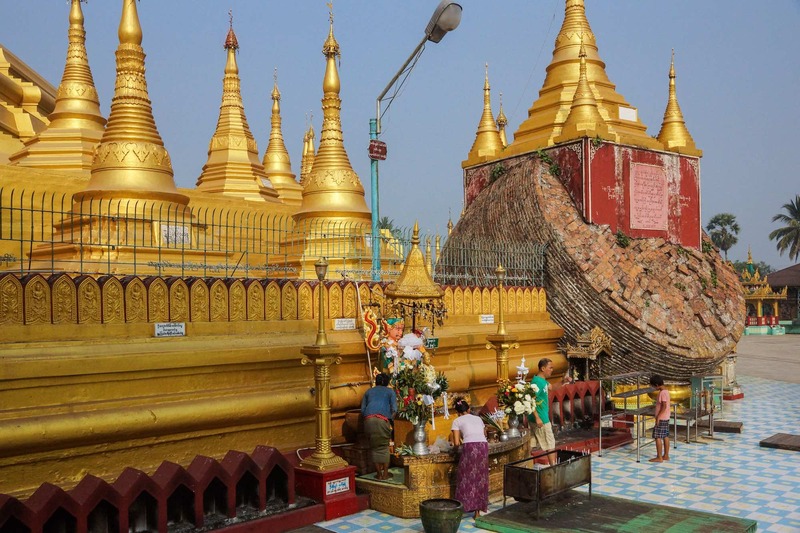 What still remains – admittedly touched up at times to quite some degree – are the religious monuments that still attract travellers from far away. 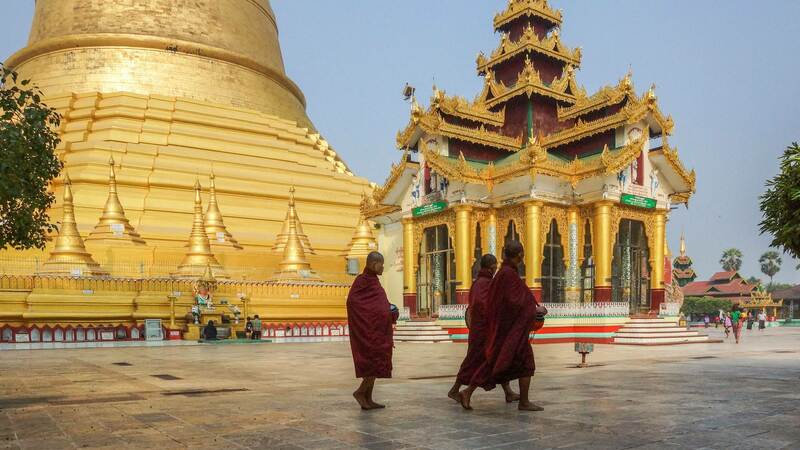 I spent over an hour taking in the scene on the Shwemawtaw terrace, siting on pavilion steps and watching monks and townspeople go by. I did not see any other “western” tourists while i was there. 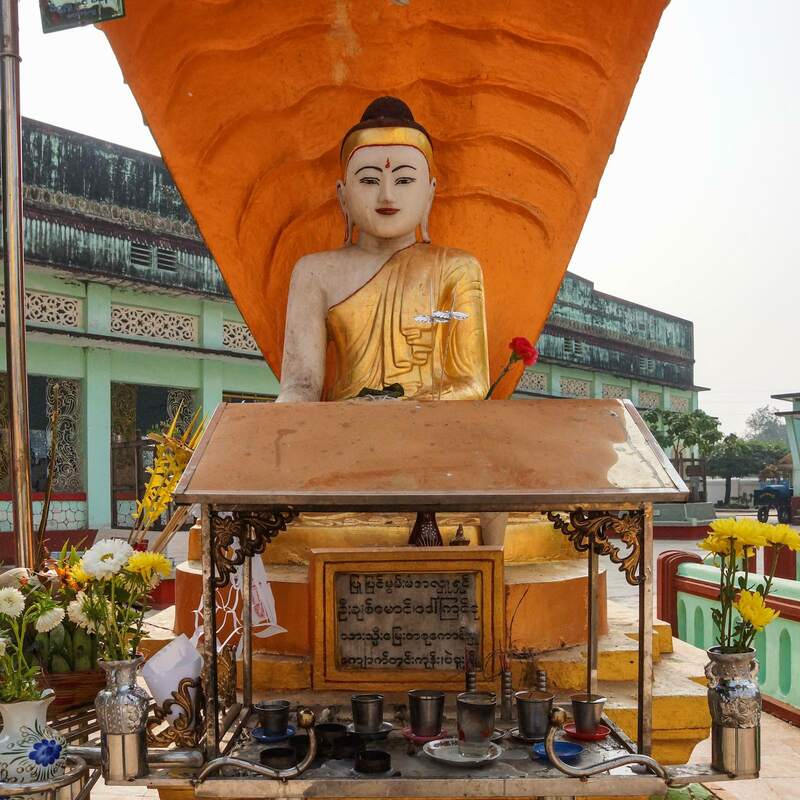 Both Gaya in northern India is where the historical Siddhartha Gautama became the Buddha, the Awakened One. 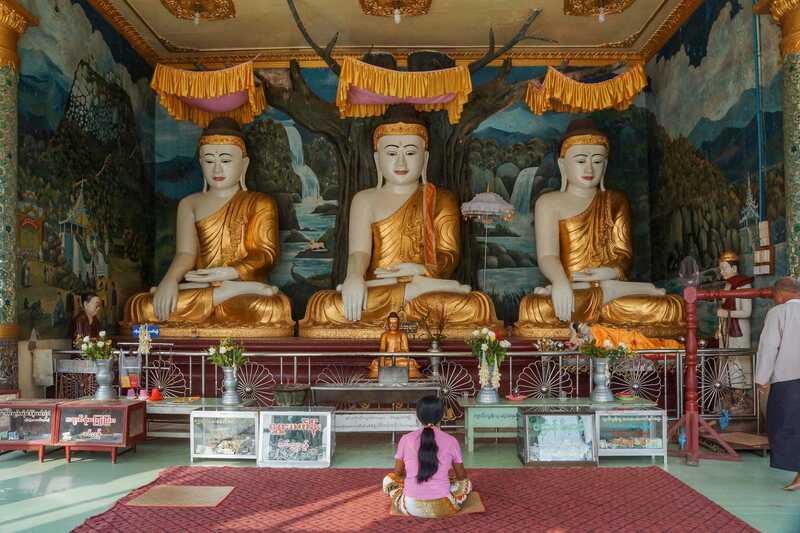 Sitting under the Bodhi Tree he resisted the progressive temptations of Mara, who tried his best to deflect Siddhartha from his destiny as World Saviour. Touching the earth with his right hand to call the Earth itself as a witness, he broke Mara’s spell. That moment is depicted in the vast majority (99%?) 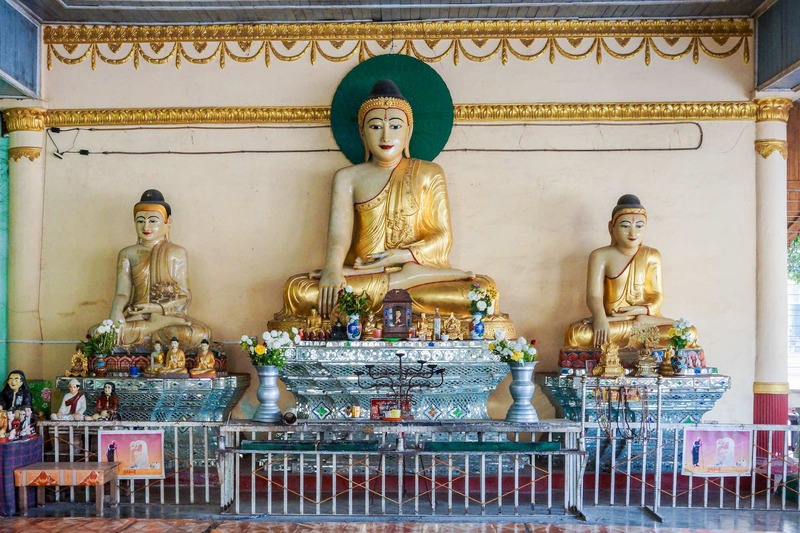 of the seated Buddha statues you will see in Myanmar. 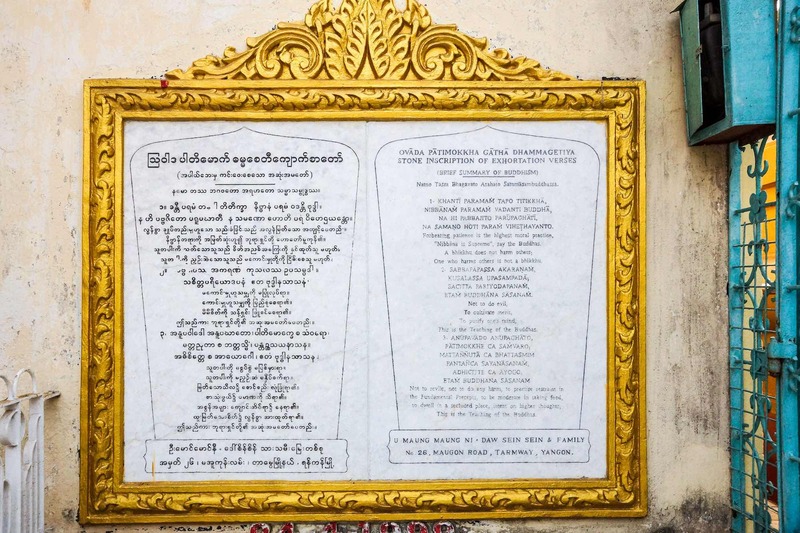 The above monument incorporates Hindu Brahmanism and its astrological concerns via the planetary posts in a Buddhist framework. 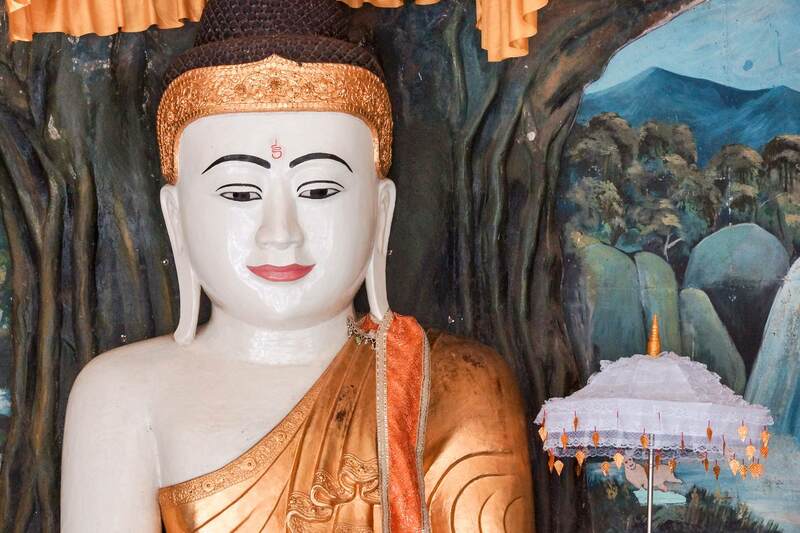 This is just one of the many syncretistic elements I noticed in Myanmar Buddhism. The most significant element – and one I can make no claim to understanding – is the presence of nat images. 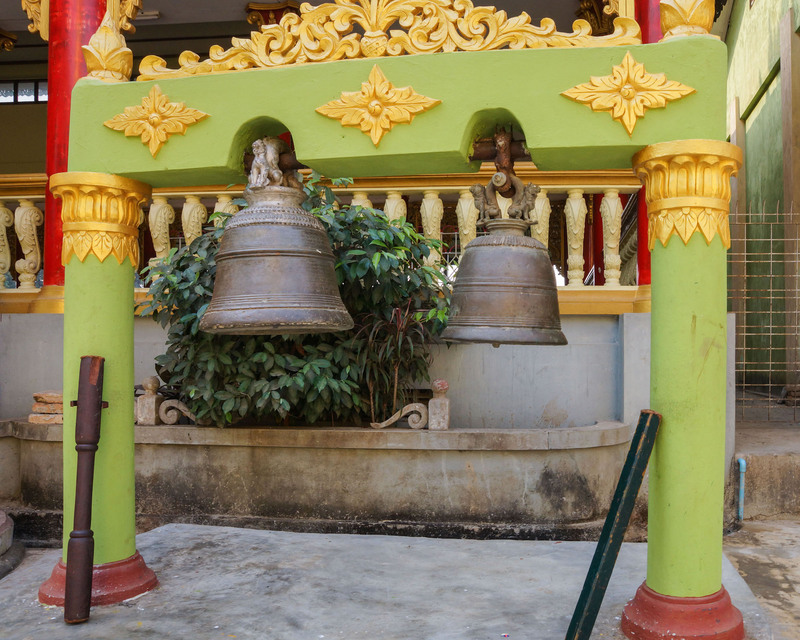 Before the Bamars turned to Buddhism around 1000 years ago, their religion was an animist one centered on the appeasement of nature spirits called nats. 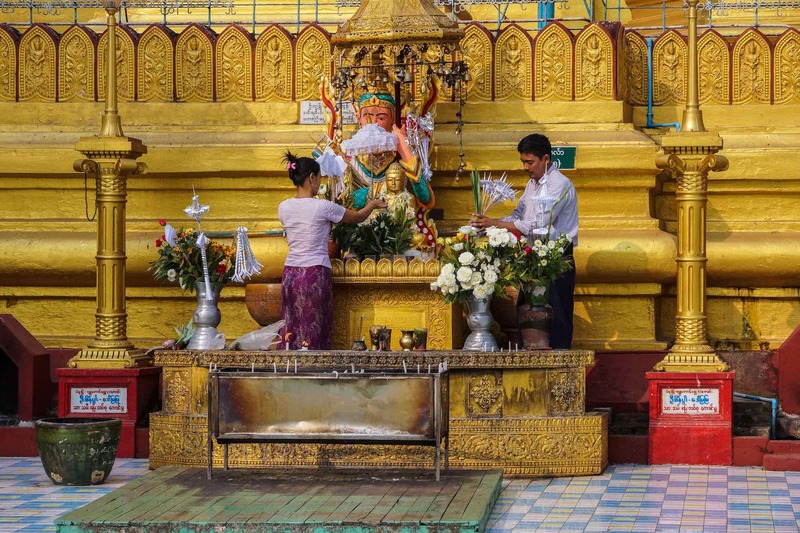 Over time a set of thirty-seven major nats and a number of minor ones developed; Mount Popa, not far from Bagan, is the major nat pilgrimage site for those in Myanmar, often country folk, who still believe in nats. 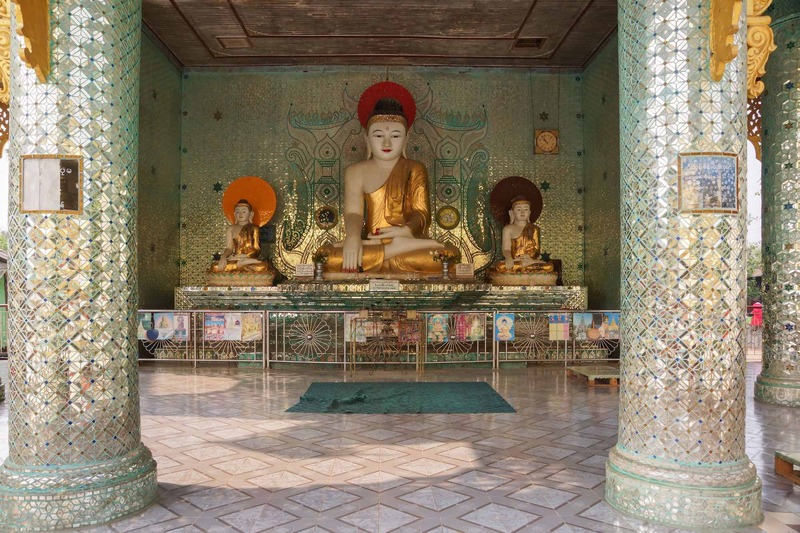 The iconic moment in Siddhartha’s life when a cobra provided him protection from the rain while he sat in deep meditation is depicted above. 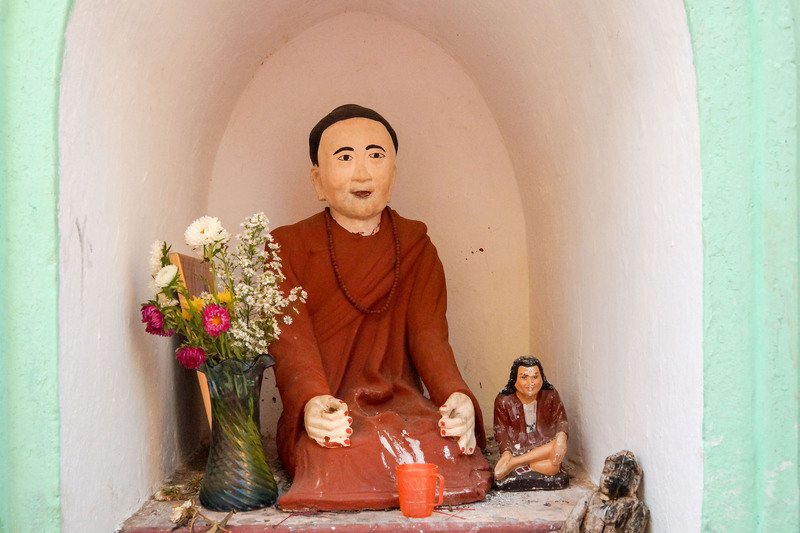 Below is what I assume is a nat figure or two; unfortunately I have yet to learn their story and what they are doing in a side shrine on the Shwemawdaw’s terrace. I walked around the zedi a couple of times. As is the custom in Tibet and Nepal, I did so in a clockwise direction. 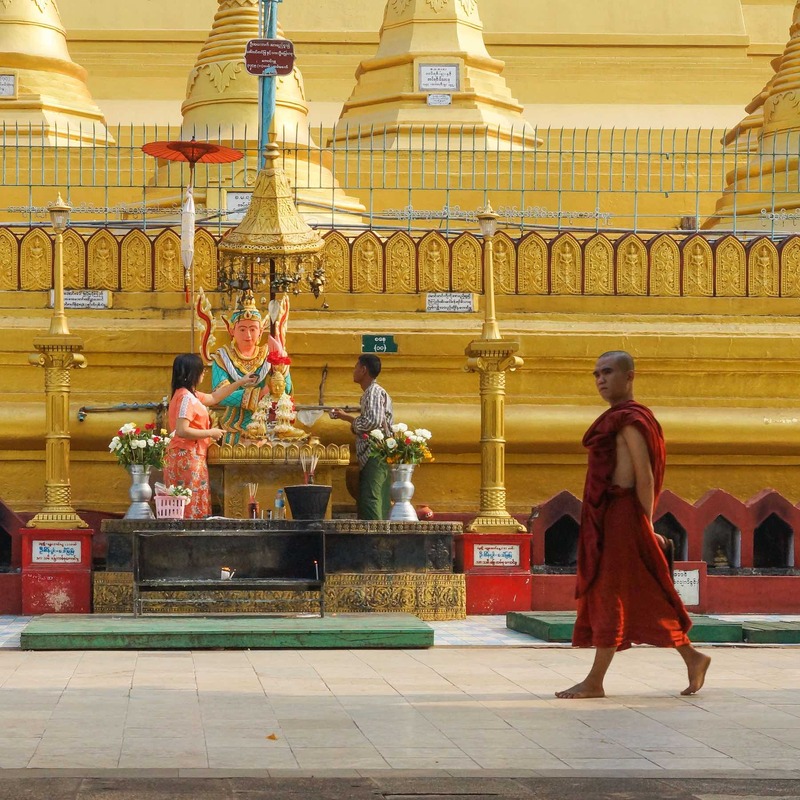 However, I noticed again that this is definitely not the custom in Myanmar as I saw monks and lay Buddhists walk either way. 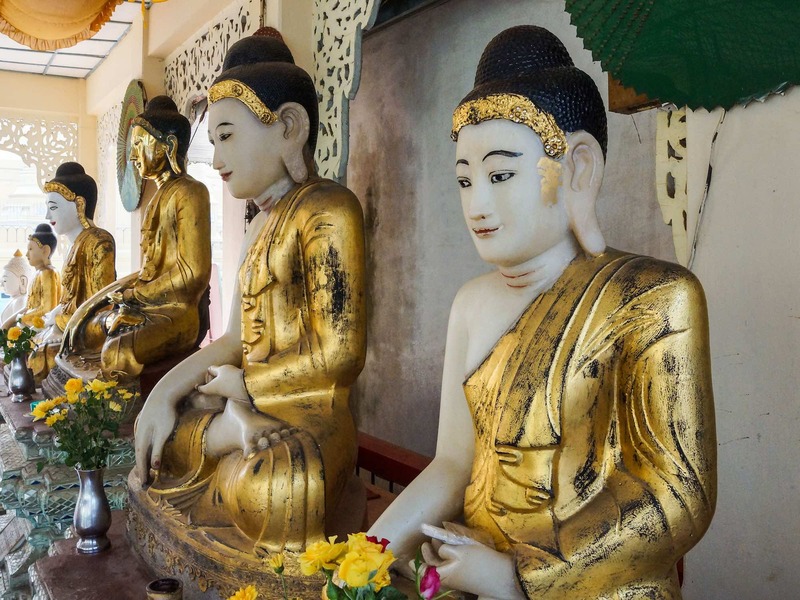 What does seem to be important is not to expose the bottoms of your feet in the direction of the Buddha statue you have stopped to pray at. Some of the images above will show petitioners with the soles of their feet properly placed! 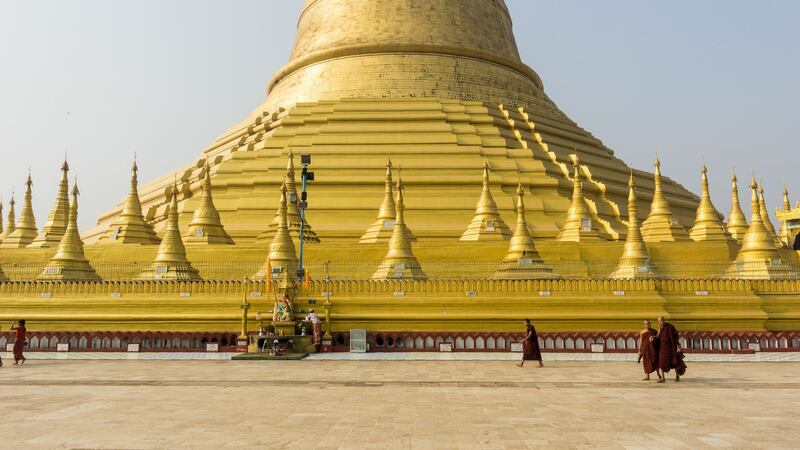 I hadn’t really noticed this custom until a few days before when, on a visit to the Shwedagon in Yangon, a French tourist chastised me for being so ignorant as to be sitting the way i was! Given all the other places to visit, it was time to move on. 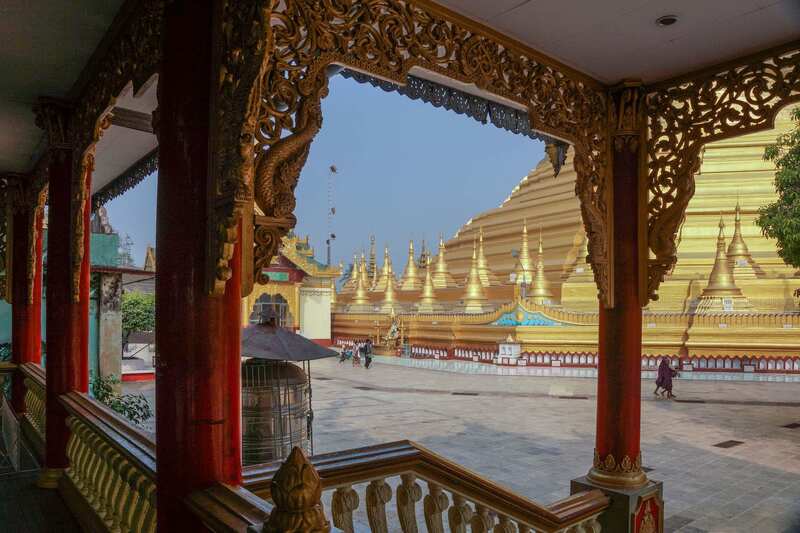 After finding my driver Yan and his car, we headed to Hintha Gon for a quick visit to the hilltop shrine – and the view of Shwemawdaw that you see above. 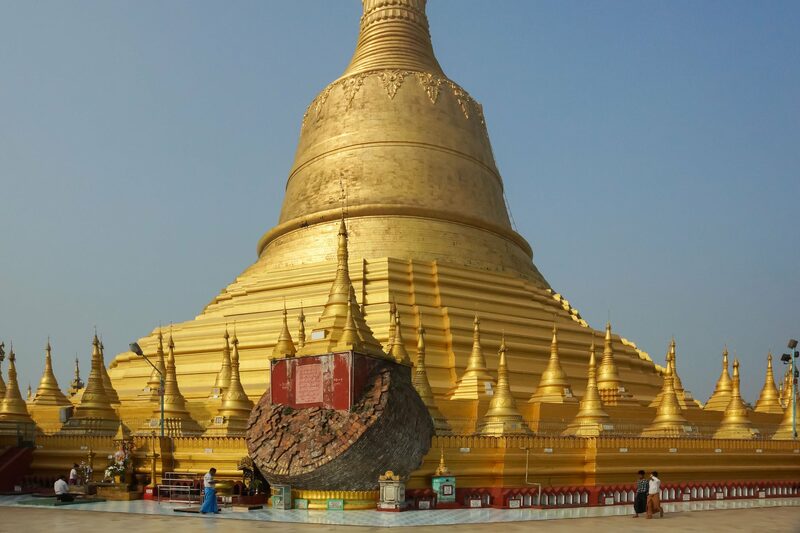 By mid-afternoon, we had checked off anther four or five sites and in the photo below I am at the top of the Mahazedi looking back at the great stupa of Shwemawdaw one last time. It was a bit hazy but it poked up over the plains of Bago.